$ave your hay! $ave your money! Bale Buddy Round Bale Feeders and Slow Feeders are designed to keep your hay clean and contained while helping you to save money and time. All Bale Buddy Hay feeders have a one year warranty to ensure that they pay for themselves many times over within the lifetime of the feeder. 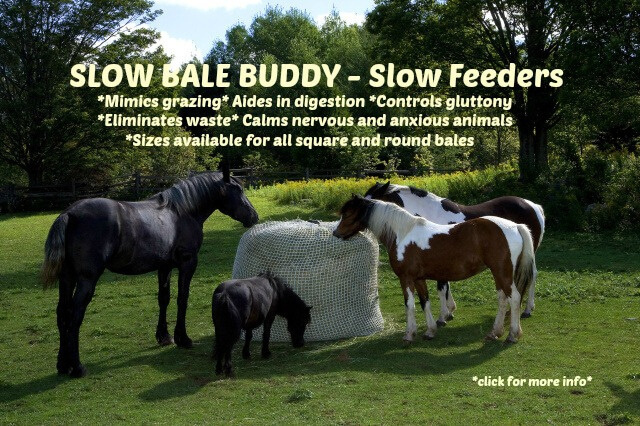 Whether you feed round bales or large or small rectangular bales, there is a Bale Buddy Hay Feeder for you. The SLOW BALE BUDDY slow hay feeder completely encloses the hay so that the animals must pull the hay through the netting to eat it, which improves digestive health by slowing consumption and mimicking grazing while completely eliminating waste. Available in sizes to fit all round and square bales. The BIG BALE BUDDY Round Bale Feeder is an economical way to keep your round bales clean and contained in muddy and windy conditions and also helps to keep the hay dry by shedding water off the sides. Available in 3 sizes. 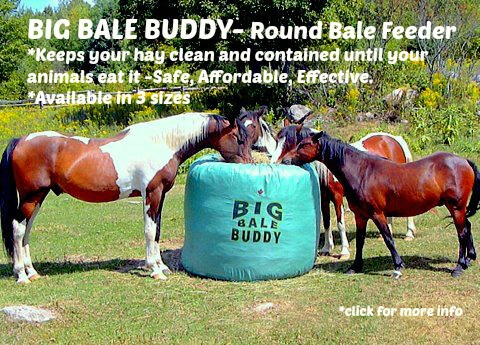 All Bale Buddy round bale feeders and slow feeders are always half price for registered horse rescues. Please contact us directly to receive discount. Now offering fast, affordable international shipping!